“Terroir” might just be the most obvious one. It seems plausible that the “input” into a tea plant must have a direct relation to its “output”: the tea in your cup. At this, climate refers to a geographical location or region’s prevailing structure of temperature, precipitation, humidity, atmospheric pressure, etc. over a long period of time. Also, the change of different seasons is part of the climate concept. Soil, on the other hand, first means the nature and composition of the soil itself in a specific place. However, the term also includes related parameters, such as altitude and prevailing flora and fauna. Other definitions include the human factor, e.g. agricultural or industrial activities, in the concept of terroir. This makes sense in that human intervention in the terroir will inevitably change the same. In the above system, the individual factors form a network of mutual relationships and interdependencies. Accordingly, the change of one factor automatically means change in the other factors and the whole system. Thanks to its adaptability, the tea plant tolerates a broad range of climates. It prefers subtropical climate with lows above freezing and maximum temperatures of 30+° C. Depending on the cultivar, however, it also thrives in hotter or cooler climates, or such with higher or lower “peak temperatures”. The tea plant prefers partial shade. Nevertheless, it needs lots of sunlight, but also significant downpoors, both best all year round. In many tea growing areas, seasonal droughts are compensated by irrigation. The tea plant prefers a slightly acidic (pH 4.5-6.5), well-drained soil without waterlogging. Apart from that, it grows on different types of soils, such as sandy, rocky and volcanic soils. Wuyi “rock teas” teas come from a number of distinct tea cultivars in a specific core area of ​​Wuyishan. This area is called “zhengyan” (= “original rock”). It is the special mineral composition of the rocky soils in the “zhengyan” area that make up Wuyi rock tea. Also, the border areas of zhengyan area (“banyan”) still give teas grown there some level of “rock tea” character. However, not so the “wai shan” (out of the mountain) areas, lacking the characteristic rocky bottom. This means that tea from there – even from the same cultivar – is a Wuyi Oolong, but not a Wuyi Rock Oolong. As the example shows, local differences in the terroir can occur even within a relatively small region. The tea plant from which your tea was picked is directly related to its terroir. Thus, many of China’s classic teas come from varieties that the terroir associated with a particular location has once brought about. An example for this would again be Wuyishan’s old “rock tea” cultivars. But there are also younger examples. For example, “Darjeeling” tea is the product of tea plants brought from China in the mid-19th century. Nevertheless, Darjeeling’s specific terroir has long since put its stamp on these tea plants’ descendants. We have said that the tea plant has a tendency to adapt to a changed terroir. This applies, on the one hand, when the tea plant changes places, for example when “transplanted” for cultivation purposes. However, changes in the terroir can also occur in one and the same place. Changes in a place’s terroir can either be based on natural evolutionary processes or man-made. For the tea in your cup, the former is rather negligible. Because the pertaining evolutionary processes mainly took place a very long time ago. Not so neglibible is the human intervention in the natural terroir of the world’s tea growing regions. These are becoming increasingly relevant as environmental issues and climate change continue to increase. through the creation of infrastructure: housing, traffic routes, energy, waste, etc. Accordingly, the cultivation of tea itself represents a deep and hard to reverse intervention in the terroir of tea growing areas. 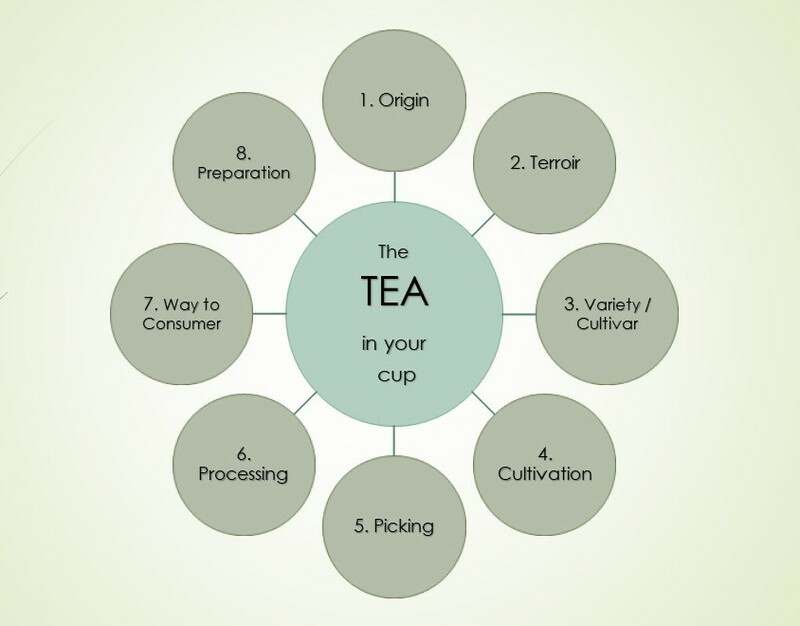 We will therefore look more closely at each of the three above points in Lesson 5, “Styles of Tea Cultivation”. We have said that any change in a climatic or soil-related factor causes changes in the entire terroir of a place. Now, you might already suspect that monocultural cultivation and the use of artificial fertilizers and pesticides have a lasting impact on the terroir in which your tea thrives. Soil impoverishment, accumulation of pollutants in soil and groundwater and the destruction of local ecosystems are just a few keywords here. In the long term, the consequences of such human intervention for the tea in your cup are significant. An omnipresent example of this would be climate change… For on the one hand it is human intervention on terroir level that causes it. And on the other hand, the effects of climate change are forcing tea farmers in the world’s traditional tea cultivation regions to adapt to a changed terroir.